Effective immediately, the Office of Enrollment Services and the Office of Marketing and Communications will be consolidated under the leadership of Vice President Shane Davidson in a new Office of Enrollment and Marketing. Vice President Don Jones has concluded his service to the University, and I am deeply appreciative of the energy and commitment that Don demonstrated throughout his time here. I know that you’ll join me in wishing him the best of luck in his future endeavors. I am confident as well that you’re ready to offer your enthusiastic support to Shane as he fulfills his new responsibilities. The eighth annual Honoring Women Veterans Conference will be hosted at UE on Saturday, June 17. The conference is FREE and open to women veterans and current service members. Registration is required by June 1 at www.evansville.edu/veteransaffairs or by calling 812-488-2141. Attendees will receive valuable veteran benefit information, enjoy a complimentary luncheon, and an afternoon of being pampered with massages, manicures, facials, prizes, and more. This year's special guest speaker will be Marylyn Harris, MSN, MBA. Harris is a US Army veteran and founder and executive director of the country’s first Women Veterans Business Center located in Houston, Texas. She is committed to improving the health status (mental and physical), education, and economic opportunities of women and girls. The mission of the Women Veterans Business Center is to connect, educate, and empower women veterans and military families to start and grow wealth-generating veteran-owned businesses. Harris has received numerous awards and recognitions for her work including the prestigious White House Champion of Change Award presented to her by President Barack Obama in 2013. Join us as we hear how Harris overcame obstacles including PSTD to lead a fulfilling personal and professional life. She has lessons to share and is an inspiration to all. Wellness screenings are scheduled to take place June 6, 7, and 8 in the Employee Health Clinic. Earn HRA credits! You can schedule up to two appointments when you sign in to AceLink. There is a recommendation for a 12 hour fast because triglycerides are included with the blood fat/cholesterol testing. However, please arrive with no less than an 8-hour fast. Hydration is important when fasting - water and black coffee are allowed prior to testing. Contact Ashley Chipps at ac375@evansville.edu with questions. Would one class that fulfills several general education requirements and teaches you valuable life skills interest you? Do you want to reduce your course load during the regular fall or spring semesters? How would you like to take such a course NO MATTER WHERE you plan to be this summer? Thirteen conference softball student-athletes have been named to the 2017 MVC Scholar-Athlete first team, including three repeat first team selections, as voted on by the league's softball sports information directors and announced by the Missouri Valley Conference office. Six additional student-athletes garnered honorable mention accolades, including Purple Aces senior Morgan Lambert. A steady slugger for the University of Evansville, Lambert finished second on the team with eight home runs and 27 RBI. Starting 50 games, Lambert has notched 323 putouts at first base. Lambert completed the season with a .261 batting average. Her top game of the season came against Tennessee State where she hit a grand slam. Lambert has posted a 3.79 GPA as an Elementary Education major. In order to be eligible, student-athletes must have at 3.2 GPA or higher, be at least a sophomore in athletic and academic standing and meet certain playing requirements. The National Fastpitch Coaches Association has announced that 667 student-athletes from 175 programs have received 2017 NFCA Division I All-Region accolades. The awards honor softball student-athletes from the Association’s 10 regions with first, second and third team selections. NFCA member coaches from each respective region voted on the teams, and all the honorees now become eligible for selection to the 2017 NFCA Division I All-American squads. Representing the University of Evansville was sophomore Morgan Florey. She earned a spot on the Mideast Region Second Team in the Utility/Pitcher spot. Florey was one of the top players in the Missouri Valley Conference this season, both in the circle and at the plate. With 194 strikeouts, Florey paced the league in that category. She also completed the year with a 1.99 ERA, third-best in the Valley. On the offensive side, the Peoria, Ill. product was equally impressive. Her nine home runs was tied for third in the MVC. She paced the Aces in that category along with her 32 RBI and .514 slugging percentage. Her honor is the first one for the program since 2012 when Kayla Fortner was also named to the Second Team. In honor of the 100th anniversary of Ernest Hemingway's high school graduation, Mark Cirino has co-written an article that appeared in the Huffington Post. Cirino, associate professor of English and Melvin M. Peterson Endowed Chair in English Literature, co-wrote the article to accompany rare and evocative images from Hemingway's high school years. Many of these photographs appeared in Hidden Hemingway: Inside the Ernest Hemingway Archives of Oak Park, a book Cirino co-wrote. 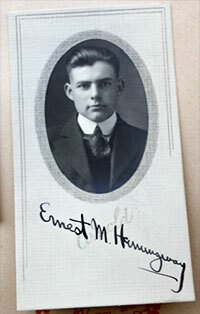 Read the article, Hemingway’s High School Graduation: 100 Years Later, on the Huffington Post website. Please join residence life and the Center for Student Engagement in wishing Betsy Whited and Justin Coffey all the best as they move on to new opportunities. Betsy is moving to Tempe, Arizona, to be a community director at Arizona State University. Her last day will be this Friday, May 19. Betsy has served as the residential coordinator for Morton and Brentano Halls for three years and the assistant director of community development this past year. Justin is moving to Medora, Indiana, to teach social studies at Medora Junior/Senior High School. His last day will be Wednesday, May 31. Justin has served as a residential coordinator here at UE for two years, first in Moore Hall before moving to Hale Hall last year. He also served as the assistant director of campus programs this past year. Thank you both for your years of service and dedication to the UE community! UE's Project Ace, a team of mechanical engineering students led by seven seniors, was awarded Rookie of the Year for their performance in the NASA Student Launch competition. The team built and tested a rocket that was designed to reach an altitude of exactly one mile and protect fragile material throughout the flight. Students competed at the Marshall Space Flight Center in Huntsville, Alabama, in April against other colleges and universities from across the US. Scoring for the award included various aspects of the 9-month project, such as reporting, presentations, design analysis, actual flight performance, and safety. The rocket will be on display on the second floor of Koch Center for Engineering and Science later this summer. Please join us in the congratulating the team on their success! 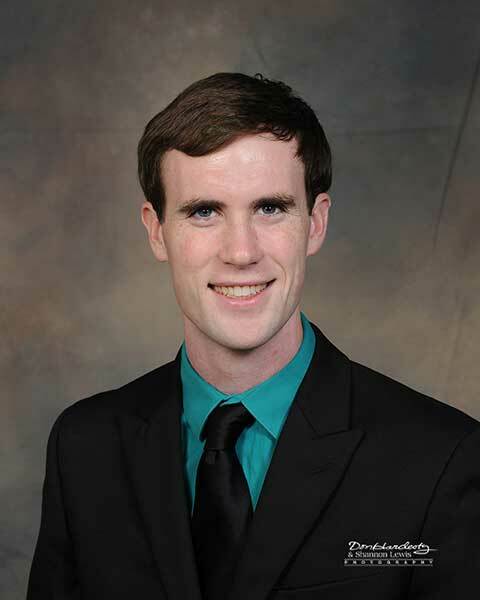 Mechanical engineering senior Austin Kraus was selected as the most recent winner of the American Society of Mechanical Engineers (ASME) Arthur L. Williston Medal national writing competition. 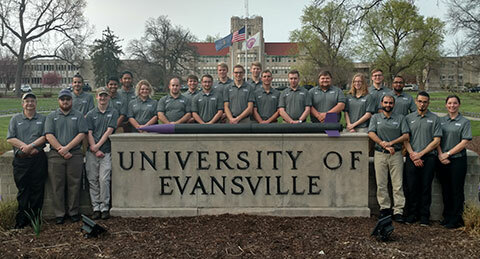 In the past 16 years, nine UE mechanical engineering students have placed: five winners, three placed second, and one placed third. Austin will receive a bronze medal in November at the 2017 ASME Mechanical Engineering Congress and Exposition in Tampa, Florida, along with a certificate and a $1000 honorarium. Heidi Strobel, associate professor of art history and Curator of the Peters-Margedant House, gave a public lecture about the Peters-Margedant House move on Wednesday, May 10. Strobel gave the lecture at her alma mater, Kalamazoo College, which is located in Kalamazoo, Michigan.